Primorial Prime Search (PRPNet) - coming soon! As you can see, there's a wide variety of work to do from BOINC to PRRNet to Manual. There are applications for 32 bit and 64 bit Linux and Windows and MacIntel/PPC (PRPNet only). WU's range from less than a minute to more than 48 hours. Best of Luck finding primes!!! Only 24 hours remain until it starts "raining" factors. A 2 day (48 hour) Challenge is being offered on PrimeGrid's Prime Sierpinski Project (Sieve) application. Come join us for a shower of factors in hopes to make those hidden primes bloom. :) For more information, please see this forum post. Hey Dingo we seem to both be sporting flash new green badges in PG. My problem is that I am colourblind and can't see the difference in some of the badges. The discovery was made by Evelyn Chew (Crackenback ) of Australia using an Intel(R) Pentium(R) CPU G3220 @ 3.00GHz with 4GB RAM running Microsoft Windows 7 Enterprise. This computer took about 2 hours 37 minutes to complete the primality test using LLR. 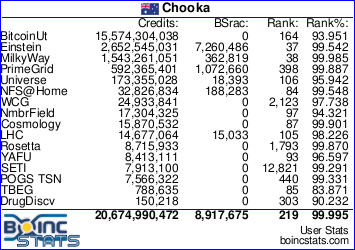 Evelyn is a member of the BOINC@AUSTRALIA team. Evelyn Chew is not a member of the forum but finding a mega prime is a great achievement. Congrats to all Team members that have crunched Primegrid. It's the challenge you've been waiting for, GCW-LLR! Running from August 20th 18:00 UTC until August 23rd 18:00 UTC. So come and join us and celebrate the Solar eclipse of August 21, 2017. I have joined PrimeGrid: 2018 Tour de Primes begins February 1st! and put all my cores and my one GPS on it. I haven't found a prime for a while. NOTE: The best setting is to have zero days work and zero additional work set in the "Computing Preferences" in BOINC Manager. This way you return work as soon as it is done, because the first one to return a Prime gets awarded the number. PrimeGrid: 2018 Tour de Primes begins February 1st! Our annual Tour de Primes challenge begins in a little over one day from now, and runs for the entire month of February. Unlike other challenges, you don't get a trophy just for participating -- you have to actually find primes to win something! As with last year, we will be awarding special "jersey badges" to the winners in four different categories. This year, we're also offering special badges that are available to anyone who finds an eligible prime! Come join us in February. More information about Tour de Primes can be found here . There have been 209 Primes found since the start which is great except I have not found any yet. Will persist until the AA starts. So guys is there a particular work unit that produces a juicy amount of credits? Or just crunch anything & everything? Anyone run multiple WU's on GPU tasks? Edit - Looks like AP27 tasks are the way to go. I think I'll just have a crack at all the short & medium tasks. Bugger it. I haven't compared the credit from all the different sub projects. It would be interesting to know which one produces the most credit. I've mainly been doing the Proth Prime Search Sieve (PPS-Sieve). It seems to do well on my NVidia GPUs. The down side is you don't actually find an primes with the PPS-Sieve. AP27 - 4043 credits but WU times varied from 6000 sec - 69000 seconds for those credits. GCW Sieve - 546 credits for between 3500 sec - 6500sec WU's. GFN 15 - 36 credits for around 70 sec WU. GFN 16 - 99.7 credits for 200 sec to 7800 sec WU's. GFN 17 Low - 425 credits for 600 sec to 35000 sec WU's. GFN Mega - 463 credits for 700sec to 37000 sec WU's. GFN 18 - 1640 credits for 1850 sec WU's. GFN 19 - 7400 credits for 7600 sec WU's. PPS Mega - 315 credit for 5100 - 10000 sec WU's. PPS LLR - 158 credits for 2500 - 6500 sec WU's. PPSE - 57.4 credits for 1000 - 1800 sec WU's. SR5 - 1740 credits for 27500 sec WU's. So this info could be useless as it seems some work is being done by my RX 480 and other work done by the HD Graphics 2500?? I just noticed when I chose the different computer number, some show the RX 480 and others show the HD.